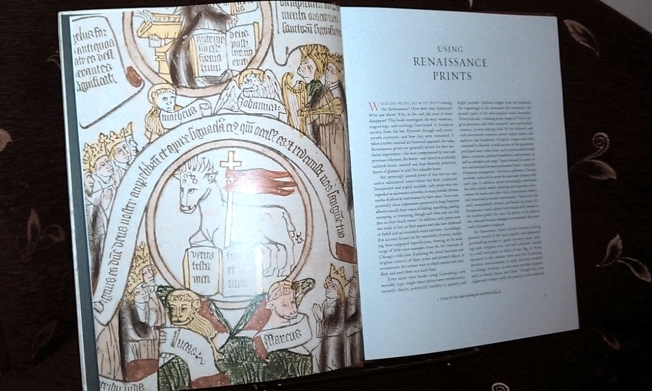 Renaissance art extended beyond the breathtaking panels and frescoes that are emblematic of the era. 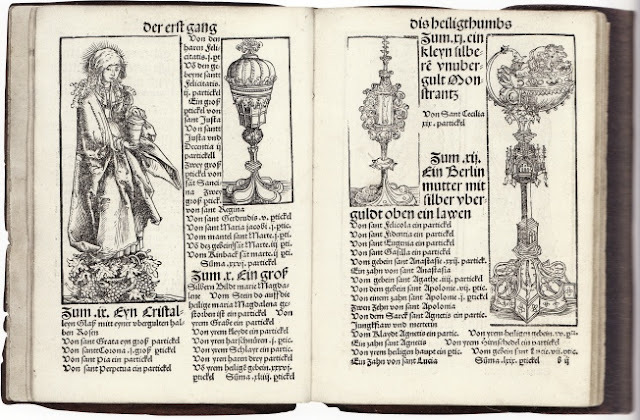 In Europe, the advent of the printing press, as well as refinements in other printing technologies resulted in an unprecedented production of items for use by a larger audience. The Art Institute of Chicago, custodian of an impressive collection of Renaissance prints hosted Altered and Adorned - an exhibition dedicated to this theme, ending July 2011. The accompanying catalogue, and its usefulness as a resource is the focus of the following review. Much thought has gone into the design of this volume. The typography is spacious and elegantly highlighted with colour, and the covers of the book itself have affixed prints. These delightful nuances in design are reflective of Renaissance prints, similarly coloured, with volumes often sporting affixed covers. The pictures are large and beautifully shot, yet the book is just slightly larger than an A4 sheet, not arduous to browse through as catalogue volumes often can be. One negative point which should be raised is the lack of an index, something of a trend in recent catalogue publications. Forewords and introductory chapters are often glossed over by readers, eager to get to the contents within. Those with a curiosity as to the motivations of an exhibition are encouraged to pay greater attention to these sections. For reviewers in particular, a well written foreword contains a concise summary of what you will encounter across the volume and the exhibition it represents. In the case of Altered and Adorned, it was fascinating to read the exhibition and its catalogue was the result of a series of key events - in this case the purchase of a French nativity woodcut still in its coffer, and the arrival of catalogue author Suzanne Karr Schmidt as Andrew W. Mellon curatorial fellow in 2008. This, and subsequent acquisitions allowed Karr-Schmidt and her colleagues the opportunity to catalogue the Institute's existing collection and create an exhibition to promote public interest and awareness. The structure of the book, as outlined in the table of contents is according to types of prints, their size and function. Hence, in each of these sections there is a pleasing variation in the range and location of works presented. This thematic and functional organisation made for pleasant reading, comparing and following themes and techniques over time and place. In a recent post at Studio Matters on Michael Fried's contribution to a recent Caravaggio catalogue, I proposed that a successful catalogue is one which captures the aesthetic and historical significance of the period in question and does this in a manner that is useful for educators, artists and general visitors to the exhibition. On these points, Altered and Adorned is undoubtedly successful. Sections written by both Karr-Schmidt and Kimberly Nichols are in clear and concise language. There is no verbose meandering over internal constructs, yet we still get some heartening glimpses into the minds and lives of the people who made and owned these objects. A wonderful example of this, readily familiar to readers past and present is the making of notes in margins, known as marginalia. Owing to the expense of panel paintings, such immediate personal responses are of course unlikely, often depriving us of the response of the patron to the work. In prints, we get these feelings jotted down alongside the text or image that inspired them, giving us a delightful glimpse into a very specific moment in time, long past. 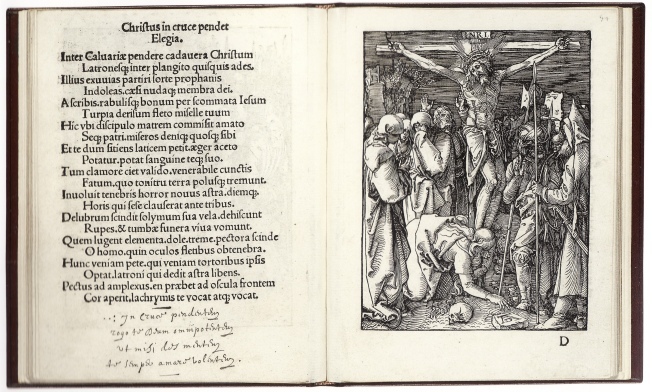 This represents a pious moment of reflection on behalf of the reader - although it should be noted the inscription was not an original composition, but a quote from the last four lines from the Hours of the Cross. One of the great delights in the collection, and catalogue is the range of prints described. It is fascinating to learn of printing used on fabric, affixed to items and even edible prints. Reading these examples, it is easy to feel a strong affinity for the people using these prints, as our own modern lives are inundated with representational media in various forms. Owing to their ability to be reproduced in number, prints were ideal modes of disseminating information on any contentious topic. 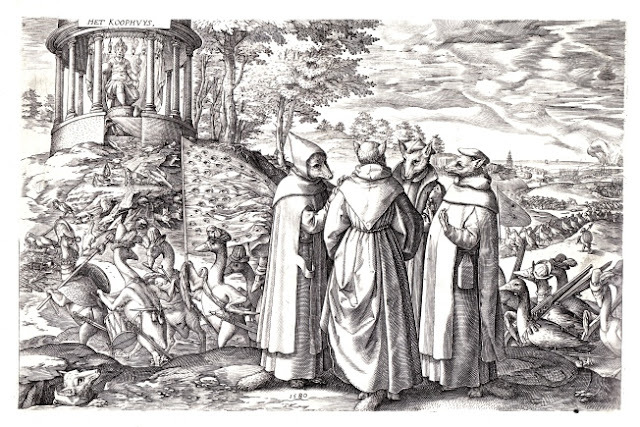 A delightful illustration of this is presented in the form of Allegory on the defeat of the Duke of Avila at Brielle, 1580, its creator presently unknown. ...this luxurious catalogue is more than just an illustrated book: it offers us a cornucopia of printed religious objects designed by Cranach, becoming a cross between a categorized collection and an extended broadsheet of wonders. *A silver statuette with 44 of her relics mixed in with "contact relics"
Lucas Kilian's Third Vision (Eve), anatomical flap print from Mirrors of the Microcosm, 1613. 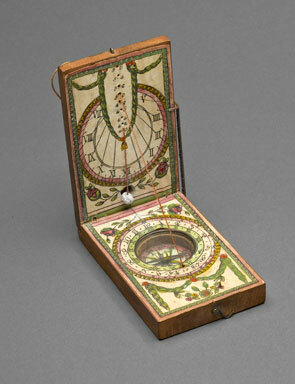 Printed items also formed part of the construction of scientific instruments - a particularly beautiful (later) example of this in the Chicago collection is a c.1790 Portable Compass Sundial designed by J. Kleininger. It is constructed with a combination of wood and glass, adorned by a hand coloured etching on paper. The mystery of the messenger box? A recent addition to the Chicago collection, the late sixteenth century Parisian armored "messenger" box presents us with a rare glimpse of an affixed print in its original context. 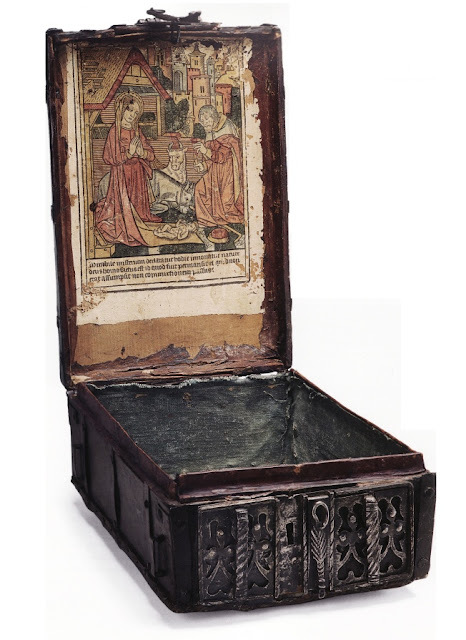 A woodcut image of the nativity, decorated with water-colours remains inside the lid of the box. This piece is attributed to the workshop of the same master who produced the Very Small Hours of Anne of Brittany. It is referred to as a messenger box, though the catalogue acknowledges its true function is not known from documentary sources. The variety of names given the genre since the early 1900s reveals this confusion, with some labels highlighting their proposed roles as messenger or dispatch boxes, alms or offering boxes, book or missal boxes, and others more descriptive of their hybrid nature. Altered and Adorned is a uniquely designed, approachable volume. It is a remarkable example of an effort to consolidate a museum collection and promote its wonders to the public. 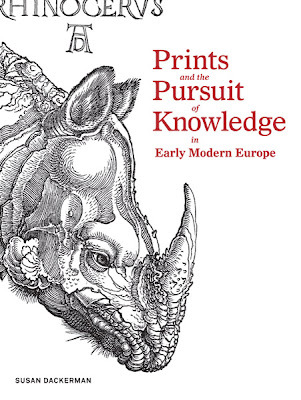 It serves as a useful resource, giving a systematic account of print types and mediums commonly employed by artists in Early Modern Europe (with some non-European examples mixed in). It is a recommended introductory text to the wonders of Renaissance prints, with a resonant familiarity to our own image and text dominated lives. Many thanks to the Art Institute of Chicago, Yale University Press and Inbooks Australia for the review copy. I really loved the exhibition, and have thought about it often since. I definitely want to get this catalog now, thanks for the great review! 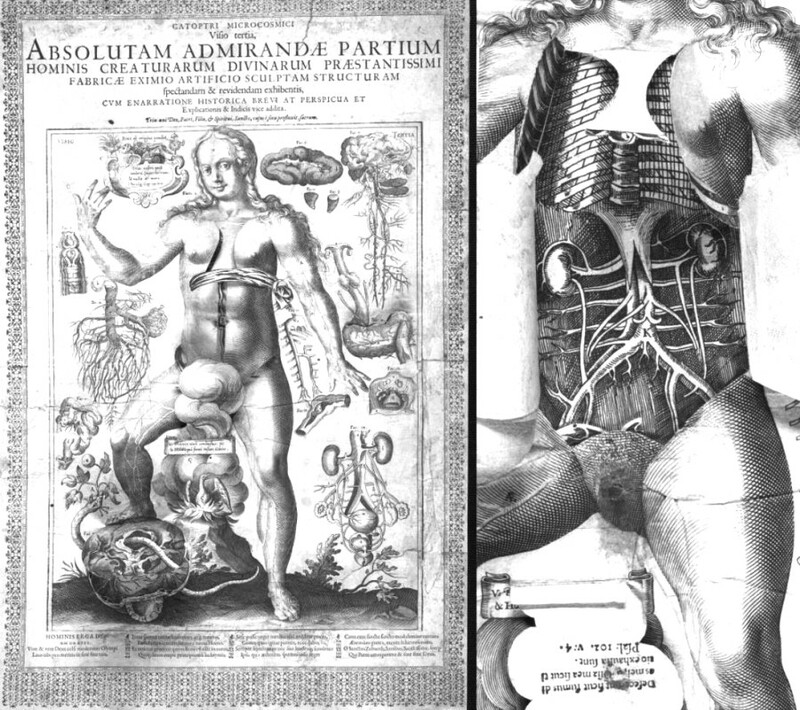 It's good to see the Art Institute Chicago website has the anatomy flip pages resource online now, it was an interactive feature in the exhibition! Love your blog, much to explore here! Hello K! Welcome to 3PP. Many thanks for the kind feedback. This catalogue was definitely a surprise and delight! I wish I could have seen the exhibition, you're very lucky! It sounds like the table of contents would prove to be a helpful guide for finding material, even if the catalog didn't have an index. I'm glad to hear that you found writing in the catalog that was approachable and concise. Hi M! I mentioned that in "Form and Format" - there is NO index here too! It's the very first thing I look for whenever I encounter a new catalogue these days! The style of writing from Karr Schmidt and Nichols was a delight. Thank goodness Michael Fried has not taken it upon himself to delve into Early Modern prints, another rambling guest essay in a catalogue from him would have been too much!